New Super Mario Bros. U is a masterful platformer, which should not be missed. Ever since the Nintendo Entertainment System hit store shelves in the 1980s, Nintendo has primarily banked on one character: Mario. The iconic, overall wearing plumber, has been busy over those years, appearing in countless video game releases over multiple genres. The simple fact is that no digitized creation is more iconic than the Italian platformer is, which is proven by not only his cumulative monetary return, but his ability to stay popular for almost three decades. Only a small percentage of our world’s fictional entertainment properties have done the same, making the feat all the more remarkable. In order to help launch its brand new Wii U console, the Big N has once again enlisted the help of the Mushroom Kingdom’s protector, through New Super Mario Bros. U. An experience that pays homage to the past through familiar gameplay tropes, the title is surely going to sell like hot cakes, simply because of the franchise it belongs to. However, despite the fact that many will make their purchase via blind buy means, they’ll still be making a great decision. Simply put, Nintendo EAD’s latest release is an incredibly impressive effort, which properly celebrates Mario’s first appearance in true high-definition. Although close to thirty years have passed since the 1985 release of Super Mario Bros. not much has changed. Players are still tasked with taking a colourful hero from the left to right, while breaking blocks and dealing with pattern-based enemies. The core experience that millions fell in love with back then is still very much alive within this homage-filled semi-sequel, despite the fact that new enemy types and more advanced stages have been incorporated into the mix. You see, there’s never been anything wrong with the iconic formula. 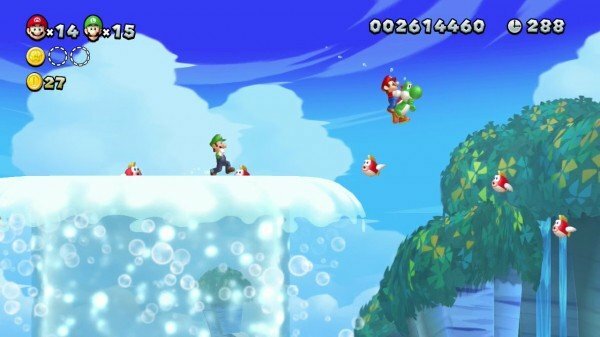 Even though we’ve been inundated with side-scrolling Mario games, especially in recent years, the series’ perfectly tuned platforming mechanics are still thoroughly enjoyable. Then again, that’s why these games release to such a great amount of buzz, not to mention such high expectations. Before we continue, the stage should be set with an introduction to the game’s basic, but colourfully crafted storyline. Unsurprisingly, the tale that is presented throughout what is a rather lengthy five to six hour-long campaign, focuses on yet another one of Bowser’s attempts to kidnap the Mushroom Kingdom’s Princess Peach. It goes without saying that the green and yellow dinosaur is a devoted soul, because he’s yet to give up after numerous failures. That’s a good thing for us gamers, because his routine criminal activity usually paves the way for quality gaming. That’s definitely the case here, as we must help save the Princess from her castle, which has been blocked off from the rest of the world by magical windstorms. At its core, New Super Mario Bros. U is a creative follow-up to its Wii-based predecessor. Taking that specific peer’s cooperative focus further, the Wii U’s most popular launch title magnificently supports five users at one time. It’s possible due to the fact that the console allows players to use WiiMotes in conjunction with its high-tech, touchscreen enabled GamePad. The four users who happen to be holding the motion remotes that allowed the Wii to become such a phenomenon get to experience the brunt of the action by controlling Luigi and Toad, along with the latter sidekick’s two colour coded clones. 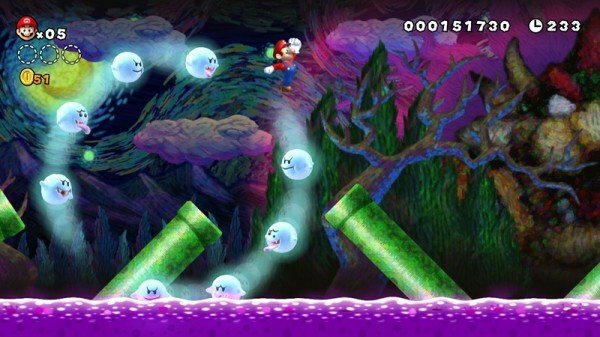 While solo players can use a mixture of traditional inputs and basic motions to control Mario using their black or white GamePads, that isn’t the case when it comes to group multiplayer sessions. Instead, the controller’s touchscreen is used as a block creating machine. Yes, you read that right; you can actually help your friends by placing platforms for them to jump onto. It’s a neat twist on familiar tropes, which is quite a bit more fun than its descriptors suggest. However, the support role will surely become boring if only one person fills it during a lengthy session. Switching controllers is, of course, the antidote to that potential problem. As mentioned earlier in this review, the gameplay content that is herein referred to as “the action,” will be familiar to almost all interested parties. The fact is that New Super Mario Bros. U is a rather simple, yet effective experience, which stands out because of its perfectly tuned mechanics, as well as its vivid and well designed stages. The Mushroom Kingdom has never looked better, with a lot of the credit going to the aforementioned high-definition upgrade, though Nintendo EAD’s art department also deserves a commendation. Its members’ blood, sweat and tears went into crafting all of the impressive levels and visceral animated backdrops featured within this game. 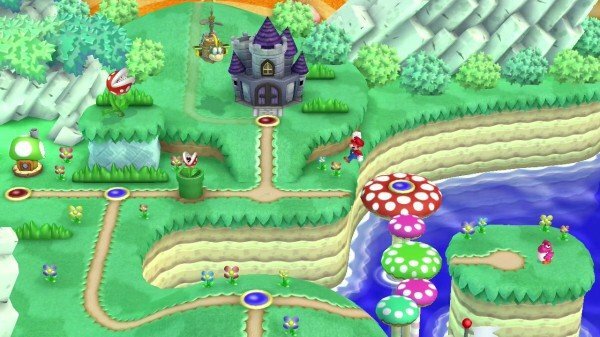 In fact, the worlds, and their included platforming action, look and sound so great that you’ll want to go back and take alternate routes in order to take in everything. Thankfully, there are lots of different paths to experience, and they all offer beautiful elemental designs to gawk at. Like its predecessors, fully completing this iteration is easier said than done. Sure, you can beat the game by completing the required amount of intricate and varied stages, along with the necessary amount of challenging bosses, but doing so won’t net you any awards for being a perfectionist. In order to gain bragging rights, you’ll have to thoroughly explore every level, in order to find all of the collectible coins. Within each stage, three are hidden, and they’re harder to gather than ever before. Actually, the entire game is more difficult than those which came before it, meaning that it will occasionally test seasoned gamers’ mettle. Although younger children will enjoy the colourful and accessible gameplay that this release offers, they’ll have a hard time with certain stages, and will need help with the game’s challenging boss battles. Once players have completed the campaign, and have had their fill of both coin collecting and catching the newly-introduced thieving Nabbit, they can jump into any of this game’s secondary modes. New Super Mario Bros. U contains a commendable assortment of optional content, with all of it tying into the word challenge. 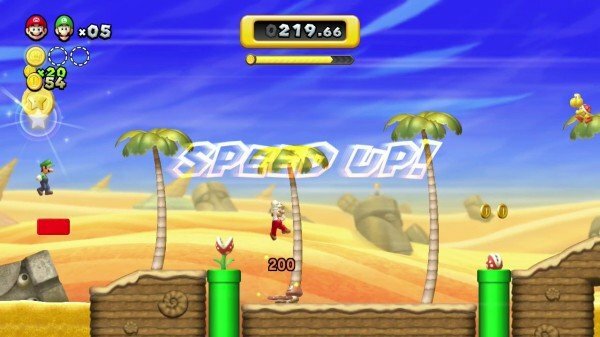 Players can test their skills against various platforming tests, including time trials, speed runs, coin collecting ventures and other quirky scenarios. Conversely, those who’d like to take the multiplayer route can compete against their friends in coin collection battles. Now that Nintendo’s much-anticipated launch of its impressive Wii U console is upon us, I’m happy to report that New Super Mario Bros. U is an absolute must buy. It’s tough to complain about what is a thoroughly entertaining and incredibly polished interactive experience. If you’re looking for a high quality launch title to purchase along with your system bundle of choice, you certainly cannot go wrong with this one.